This Wards Intelligence report focuses on fuel-cell technology and the regional and global market outlook for fuel-cell vehicles in coming years and decades, including OEM and supplier strategies to meet projected market demand. 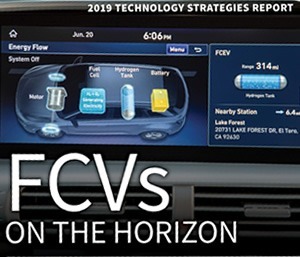 Wards Intelligence has been reporting on trends in fuel-cell vehicle development from concept to production vehicles for two decades and now adds the latest information and data to present a comprehensive look at the FCV market and its future. Author Roger Schreffler, a veteran business journalist and longtime Wards correspondent, provides an in-depth analysis of how each automaker is developing and marketing fuel-cell technology and how well they are positioned for a hydrogen future that lies just over the horizon. Aimed at automakers, suppliers and market analysts seeking insight into how each OEM is positioned today and the likely future for each OEM in terms of developing and marketing fuel-cell vehicles and technology, this report provides a thorough analysis of the state of fuel-cell vehicle technology, OEM marketing strategies and trends in the U.S. and global markets..
Order the Fuel-Cell Vehicle Report Now!